51 Lemon Custard Pie. Sarah. 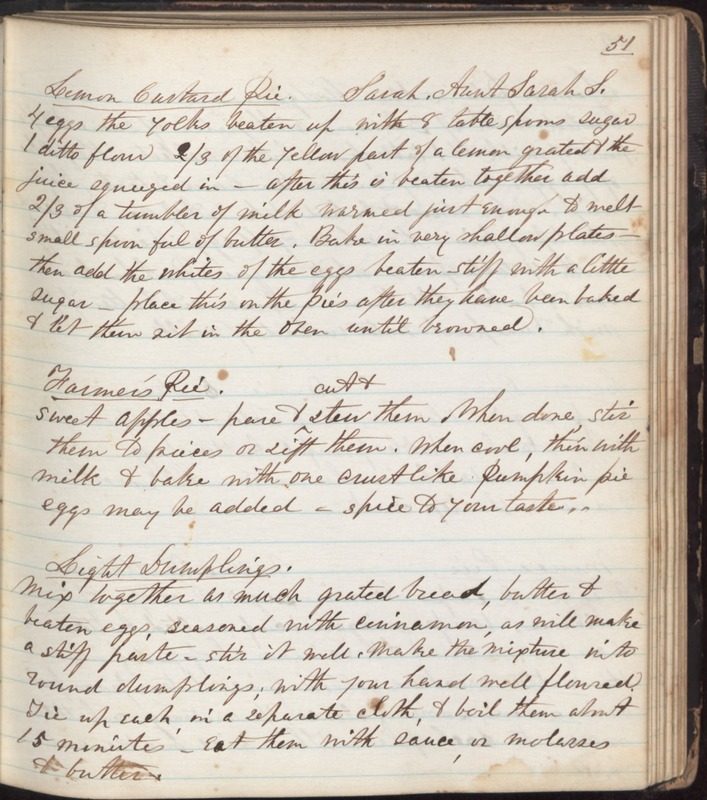 Aunt Sarah S. 4 eggs, the yolks beaten up with 8 tablespoons sugar 1 ditto flour 2/3 of the yellow part of a lemon grated & the juice squeezed in - After this is beaten together, add 2/3 of a tumbler of milk warmed just enough to melt small spoon ful of butter. Bake in very shallow plates. Then add the whites of the eggs beaten stiff with a little sugar. Place this on the pies after they have been baked & let them sit in the oven until browned. Farmer’s Pie Sweet apples – pare & cut & stew them. When done, stir them to pieces or sift them. When cool, thin with milk & bake with one crust like pumpkin pie. Eggs may be added. Spice to your taste. Light Dumplings. Mix together as much grated bread, butter & beaten eggs, seasoned with cinnamon as will make a stiff paste. Stir it well. Make the mixture into round dumplings, with your hand well floured. Tie up each in a separate cloth, & boil them about 15 minutes. Eat them with sauce or molasses & butter.